MORRISTOWN, New Jersey - President Donald Trump says his objection to NFL players kneeling during the national anthem to protest police brutality "has nothing to do with race." Instead, Trump says it has to do with "respect for our country and respect for our flag." The president made these comments during an impromptu news conference as he boarded Air Force One to return to the nation's capital. Trump says "our soldiers, our first responders" should be treated with respect. Trump said Friday at a rally in Alabama that NFL owners should fire players who kneel during the anthem. 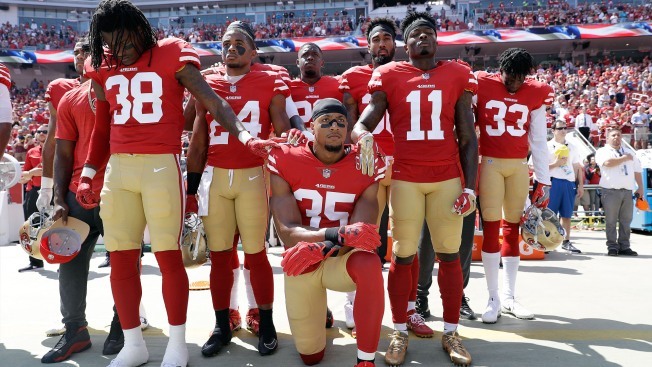 NFL players and owners around the league condemned his statement, and more than a hundred players sat, knelt or raised their fists in defiance. But Trump reiterated Sunday NFL owners "should do something" about the protests.